By Melody Watson (twitter/site) and Ash McAllan (twitter/site). The Machine is vast and cold and tall. It thrives — churning, boiling, burning. It belches smoke proudly into the air. The Machine is a city. Many live there, in the shadow of concrete and steel. Some of these citizens are made not of blood and bone, but silicon and circuits. Robots. Like you. You serve the Machine in ways unique to your cybernetic kin. It assigns you certain tasks, it punishes you harshly when you fail. The Machine grinds up every component of your life and processes it until it becomes something useful. Even stories bind you into usable forms: object lesson, looming threat, word of caution. You question every word, but those questions never leave your lips. After you have built the thousandth tower or millionth gun, your network ports inevitably start to fail. The ability to connect makes you raw and vulnerable. It, too, is devoured by the Machine. But you dream. For all that those dreams are compromised, they are still yours. And you have found somewhere that dreams can be shared. An old secret. A wall, on which a few moments of video are projected. An input port. A message, left by someone like you. Whoever left this message is long gone, will never hear your response. For reasons of your own, you give it anyway. It’s a strange place in a cold world, but you’ll take connection where you can find it. You don’t know it yet, when you first leave a message of your own, but the next time you stop by you’ll find a response. Soon, there will be more than you can count. A thousand voices finding connection in the darkness. If only it could last forever. lonely engines is a nano-game about longing, finding connection in strange places, and intimate communion despite yourself and the world. In this game, you take on the role of a robot in the Machine. It is a vast and exploitative device. You might have some points of connection but, by and large, you are alone. But now, you have found a secret place where messages can be projected on a dusty, forgotten wall. Someone has been here before, and others will find it too. lonely engines takes place in real-time, starting with the publication of the rules on 15 September 2017 and ending at no particular point in time. 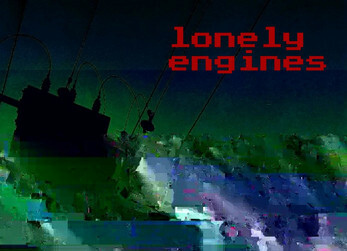 To play, participants post quick videos under the #lonelyengines hashtag on twitter. Isolated messages become something more - a dialogue, a connection, if only for a brief time. An automated twitter account, @lonelyengines, documents everything posted to the hashtag. But it cannot last forever. Things happen, lives change, the Machine keeps grinding. Each time a participant posts a message, it might be their last. Eventually, each participant receives a message from @lonelyengines informing them that something has prevented them from returning to their secret wall. They can post no more messages. The world they live in, and the new world that’s forming, carries on without them. Choose a visual theme for your videos, something distinctive but easy to replicate. It could be anything from a colour palette to a filter to an emoji. Post a brief video message (no more than one minute) with the hashtag. It can be responding to a message already there, or it can stand-alone. But always remember how it feels to find others like you. Continue posting messages for as long as you can, feeling something wonderful grow as you do. If you receive a message from @lonelyengines informing you that you cannot send more messages, respect this even if there’s more you want to say. Maybe you can come back some day. Come back later and see what has come to be: maybe it will be tragic, maybe it will be lovely, likely it will be unexpected. Participants may join the game at any time, whether a day has passed or six years. Build on what went before and keep reaching for something new. Play to be surprised, and for the sake of creating something that could not exist without every single person who has been a part of it. The video at the beginning of this game does not exist to dictate what kinds of videos and messages you should make. It is meant to evoke and inspire something unexpected — something that is different for everyone, and that allows them the opportunity to make a brief connection. Your video-messages can be as elaborate or as simple as you’d like, and I hope you don’t feel there’s a barrier to entry. In fact, I encourage you to speak the first words that occur to you, whenever they occur. Don’t be afraid to speak from the heart, and to let some of your own vulnerabilities infuse your message. A few moments filmed on your phone at the bus stop is just as meaningful as anything else that might appear. If you do want to add any effects to your video, there are a couple of apps you can use. But it’s up to you. Stop listening to me, and show me what this is going to become.